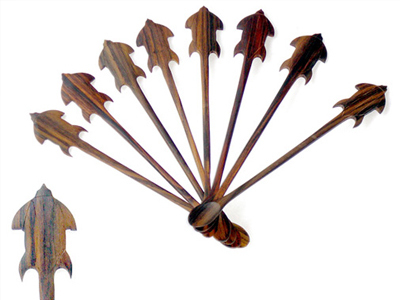 For a set of eight (8) hand carved Leatherback drink stirs. Long enough for the tall beverage glasses. (Looks cool with a mint Julep). Approx. length 9 inches. 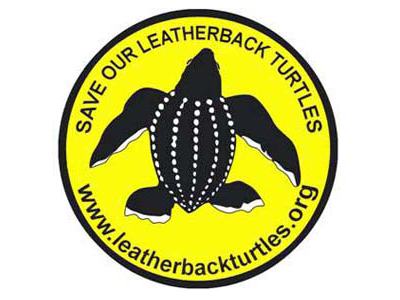 Carved Leatherback image is approx. 2 inches wide. 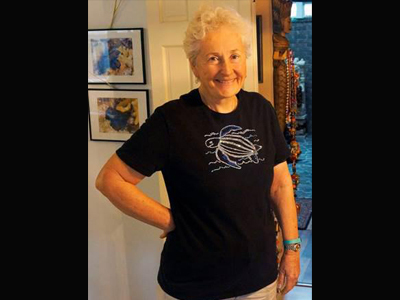 New Design by Roland St. John. Amazing detail of the. 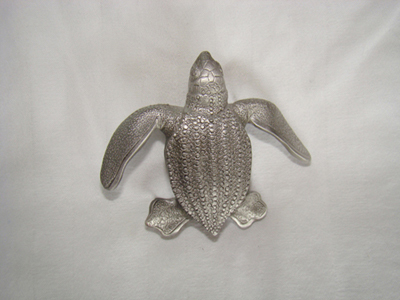 Leatherback pewter pin with 2 pips on back. Pin has been treated with a non-tarnish coating. Size is approx. 1.75 x 1.75 inches. 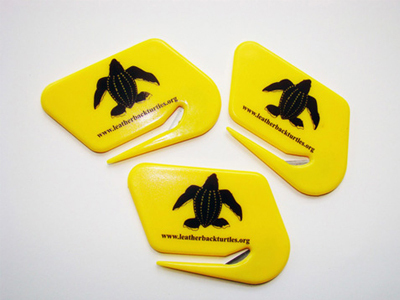 Set of Three (3) eatherback soft “squeezable” plastic key rings. A good stress relief to squeeze when in heavy traffic. Approx. 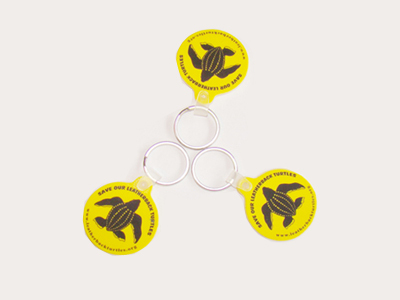 size is 2 inches with a metal circle key holder. 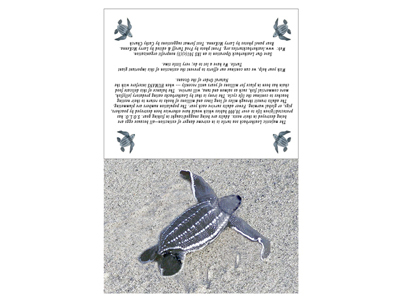 Set of four (4)-refrigerator magnets approx. 3.5 inches dia. 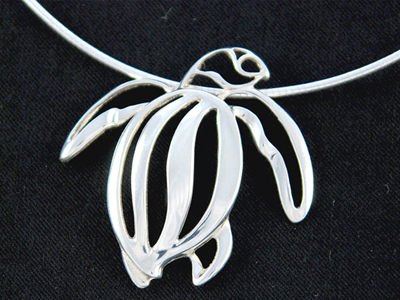 Big Blue Gifts Sterling Silver Leatherback Pendant with a 16 inch silver rope chain. 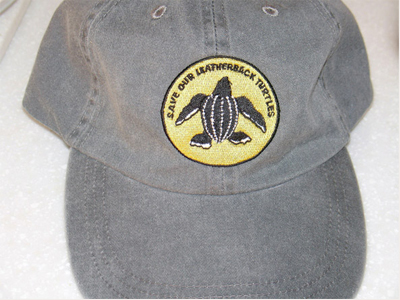 Designed by Big Blue Aquatics for us. An EXCELLENT Lady surprise gift. 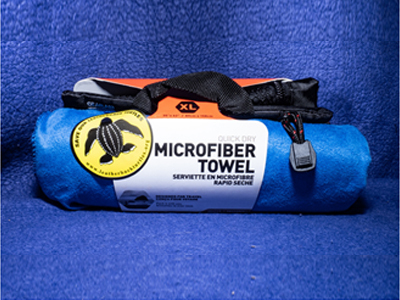 Delivered in a soft blue chamois bag or a black presentation box with a gold elastic small rope. 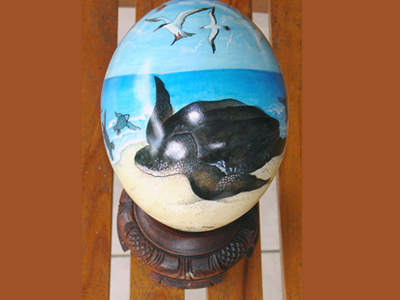 Hand Painted Cassowary (wild jungle ostrich) UNFERTILIZED egg of the Leatherback at sea and on the beach. By Bali’s original egg painter. These are Special orders. No stocks. Delivery time after payment is 3 to 4 months. Comes in a hand woven Bamboo presentation box. 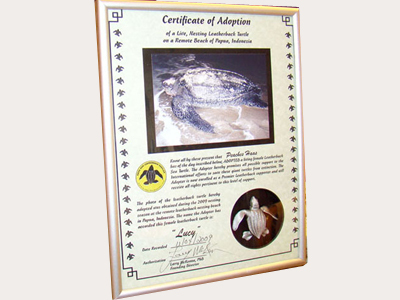 The PREMIER Certificate is presented in a platinum color metal frame designed to sit on a desk or table or to hang on a wall. Size is 11 x 8.75 inches. 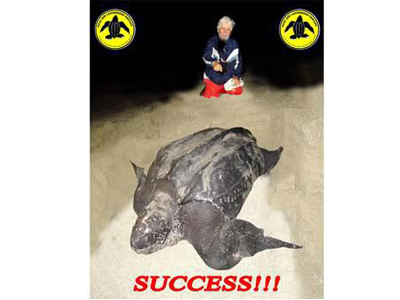 The Certificate contains a recessed new pewter Leatherback image which was created for us by Roland St. John (Big Blue Aquatic Gifts). This makes an Excellent and an unusual presentation. 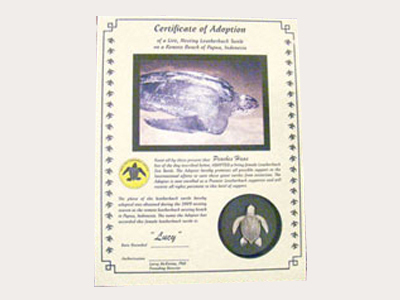 This GOLD level Certificate is the same as shown in item #20, except it does NOT have the platinum color metal frame. Add your own design of frame to suit décor. 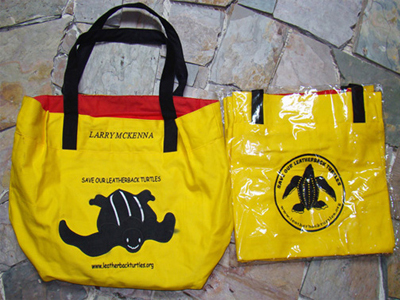 Each Leatherback photo is an original taken by Larry McKenna and signed. No photo is used more than once. 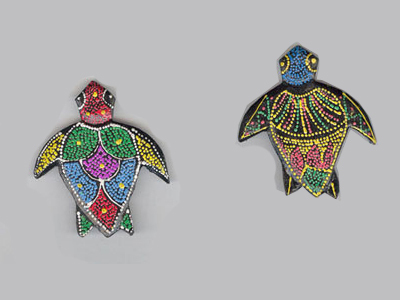 HAND CARVED TURTLE MAGNETS by our research villagers. Size is approx. 2.5 x 3.5 inches. Each is in a different color pattern selected by the carver. 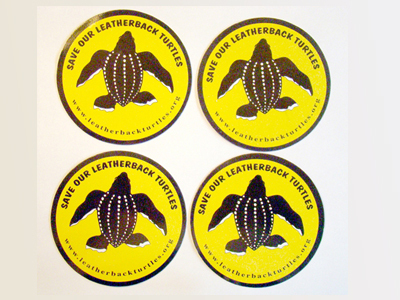 Leatherback Turtle Life Cycle Chart in color. Approx. 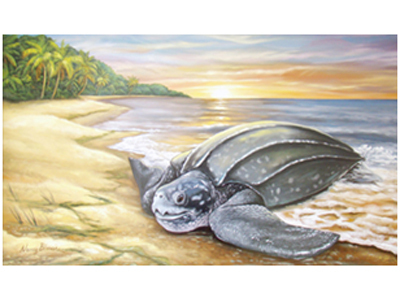 size: 14 x 24 inches Shipped in a sturdy mailing tube. 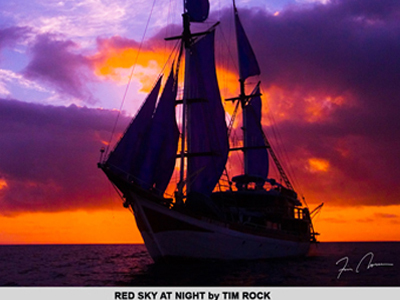 Durable Sail Cloth. Approx. size: 14 x 14 x 7 inches. Zipper Wallet Pouch inside for Purse & Keys. 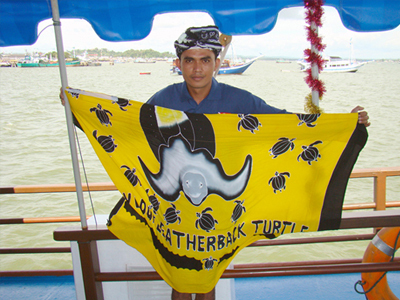 Leatherback Sarung Hand Crafted and Painted Approx. Size: 1.5 meters x 1 meter. Numbered and original artist signature. 27 x 44 inches. ONLY 3 REMAIN Original oil was taken by a Donor for $15,000. 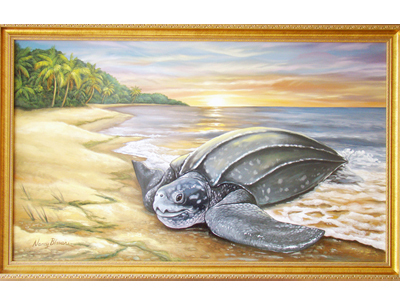 Painting is on a professional stretcher; Frame is not included. Numbered and original artist signature. 23 x 14 inches. Limited Availability. Will ship in mailing tube. 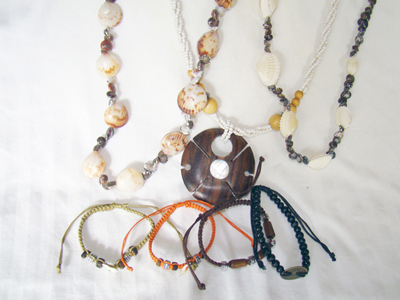 Random Assortment of Bead Necklaces and Arm/Leg Amulets. Her original painting converted into a Post Card. Packaged in sets of 10. EARRINGS usd $15 PER SET OF 2. PENDANT WITH NECKLAS usd $ 30. (SOLD SEPARATELY OR AS A PACKAGE) OF "MOTHER OF THE PEARL", OYSTER SHELL (after the oyster stops producing pearls). 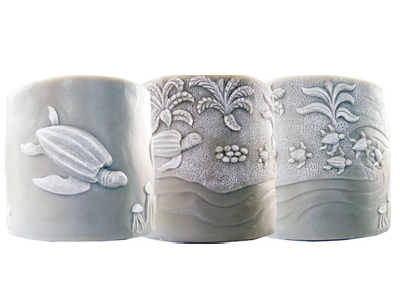 This item is PRICED WELL BELOW ANY PRICING FOR THE PURE PEARL to introduce it. Right Side Shows Pearl Shells cut from outer shell (top) and the Pearl Ready to Hand Carve (bottom). Left Side Shows the Ear Rings and the Pendant with an Included adjustable Necklace. S/ M / L $35.00. XL / XXL $40.00. Our special design of a "BLING T-Shirt" We can not keep this new black cotton, form fitting "BLING SHIRT" in stock. Soft "HAYNES" high quality shirt. ALL SIZES IN STOCK. For "INSTANT DRY OFF" post dives. This is a new color version of the huge towel ( 35 X 60 INCHES ). Designed for us by THE MCNETT CORPORATION. 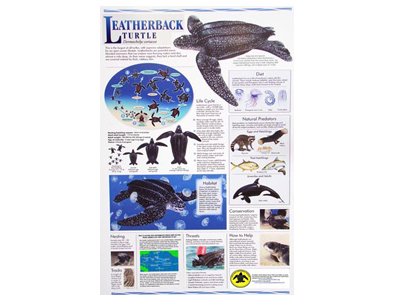 Based on the large sales numbers, This giant towel fits as a group gift or individual use. Blue color only. Shipped in a neat carry/storage pouch. 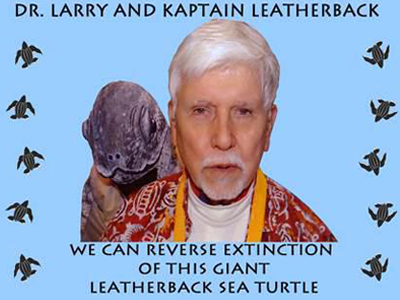 DR. LARRY AND HIS OFTEN APPEARING ALTER-EGO, "KAPTAIN LEATHERBACK" ARE SHOWN TOGETHER IN THIS RARE PHOTO. SOLD IN PACKETS OF 10.